We make FOB which means we can take care of everything from fabric, materials, cutting, sewing, welding, taping, packing and shipping. In this case we only need specifications from our customers and then we are basically good to go. Sewing room is where we hold our biggest asset: our wonderful operators, with support from these people, we can provide our customers with high quality wear. 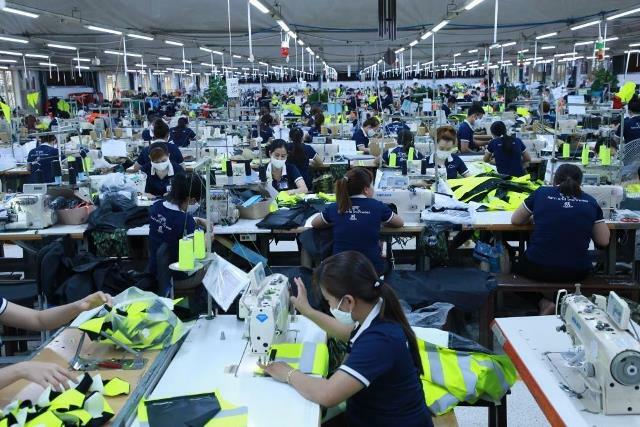 It’s important to us that our team has the right skills to make the garments we manufacture; this means we use our training line in case we need any new skill for one or more operators. New staff goes to the training line as well, to learn our quality standards and to determine what kind of machine and operations are most suitable. In the daily work we put our garments together by making components, which we attach to make linings, then we put them together and put it to the final examination. The garments we make can easily take more than 300 minutes pr. piece. Final examinaters are the last section we put garments through before it leaves the line. Our final examinations are trained to identify any problems or mistakes with garments and either reject or pass garments, our quality goals are a maximum of 3% rework and 0% seconds. Basically we manufacture any garments that are made for lasting, and that are needed in high quality. For some of the above categories, examples could be, garments for, oil-, fishing-, mining-, production-industries. We make garments for military, police, hunting and many other categories. In Viking Vietnam Ltd. We work smart every day to improve and maintain our production standards. We have a “LEAN team” with the purpose of improving our efficiency and the way we float our operation and transportation. They use their full time on one section at a time, and are very productive. The Industrial Engineering team makes sure every line is efficient and well balanced. They calculate the SMV and work together with our LEAN team to improve these things. Our quality team is also a big part of the production team; they make sure every single garment will pass our Acceptable Quality Level (AQL). In 2013 we created a Joint Venture in Bangladesh together with our partner MBM. In Bangladesh we have established a team of 60 people who are being trained to manufacture total quality; those teams of 8, are now capable of making Viking quality. We are now looking to expand the number of operatives. We have had many weeks of training, both our trainers have been in Vietnam to learn our quality and how we work LEAN. We also have teams going to Bangladesh occasionally as well. We are confident with this new part of our Viking Group, and look forward to work close together with Viking Bangladesh Ltd.